The eCall Simulator is a certified and powerful system for the development and validation of pan-European eCall, IVS and PSAP components. 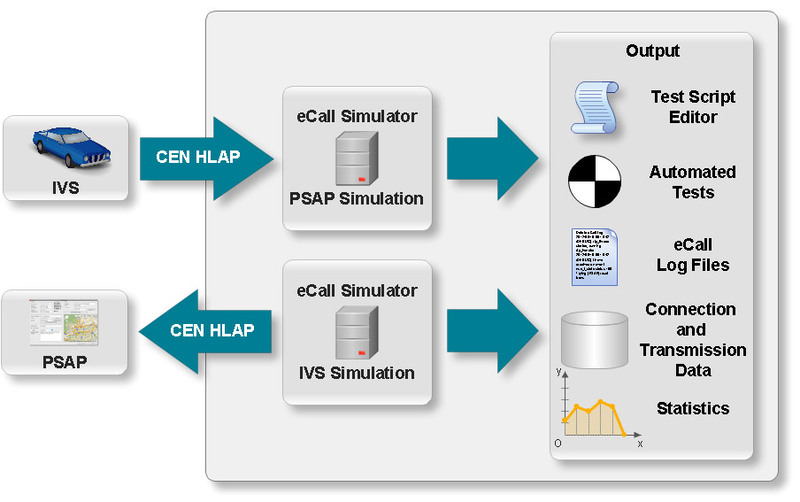 The eCall Simulator is the powerful tool for validation and conformance testing of eCall components. It can be configured as a PSAP or IVS and provides up to 76 test cases in accordance with EN 16454 (Intelligent transport systems – eSafety – eCall end to end conformance testing) and ETSI CTI Plugtests Guide Stable Draft V0.0.8. Reflecting different application areas, OECON offers the eCall Simulator in two different specifications: eCall Simulator Basic and eCall Simulator Professional. Get in touch with us and find out, which version suits you best. The eCall Simulator is a joint product of Testing Technologies IST GmbH and OECON Products & Services GmbH. It takes advantage of the proven TTworkbench as the designated tool for test execution and the certified OECON eCall components for the technical eCall part of the product.